South End Press, 9780896087880, 186pp. "Eli Clare works a vital alchemy. . . . Using the language of the elemental world, he delineates a complex human intersection and transmutes cruelty into its opposite--a potent, lifegiving remedy." --Alison Bechdel, author of "Fun Home"
First published in 1999, "Exile & Pride" established Eli Clare as one of the leading writers on the intersections of queerness and disability. With this critical tenth-anniversary edition, the groundbreaking publication secures its position as essential to the history of queer and disability politics, and, through significant new material that boldly interrogates and advances the original text, to its future as well. 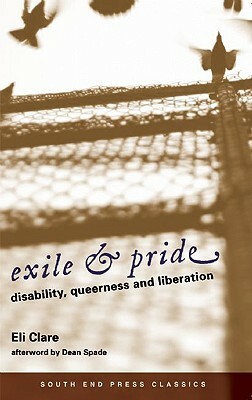 Clare's writing on his experiences as a genderqueer activist/writer with cerebral palsy permanently changed the landscape of disability politics and queer liberation, and yet "Exile & Pride" is much too great in scope to be defined by even these two issues. Instead it offers an intersectional framework for understanding how our bodies actually experience the politics of oppression, power, and resistance. At the heart of Clare's exploration of environmental destruction, white working-class identity, queer community, disabled sexuality, childhood sexual abuse, coalition politics, and his own gender transition is a call for social justice movements that are truly accessible for everyone. Blending prose and theory, personal experience and political debate, anger and compassion, "Exile & Pride" provides a window into a world where our whole selves in all their complexity can be loved and accepted. An award-winning poet and essayist, Eli Clare is also the author of "The Marrow's Telling. Poet, essayist and activist, Eli Clare lives in Vermont where he spends time both writing and rabble-rousing. He has walked across the United States for peace, helped organize the first-ever Queerness and Disability Conference, and speaks widely about disability, queer identities, and social justice. The award-winning author of two books, Clare's writings have appeared in scores of periodicals and anthologies.